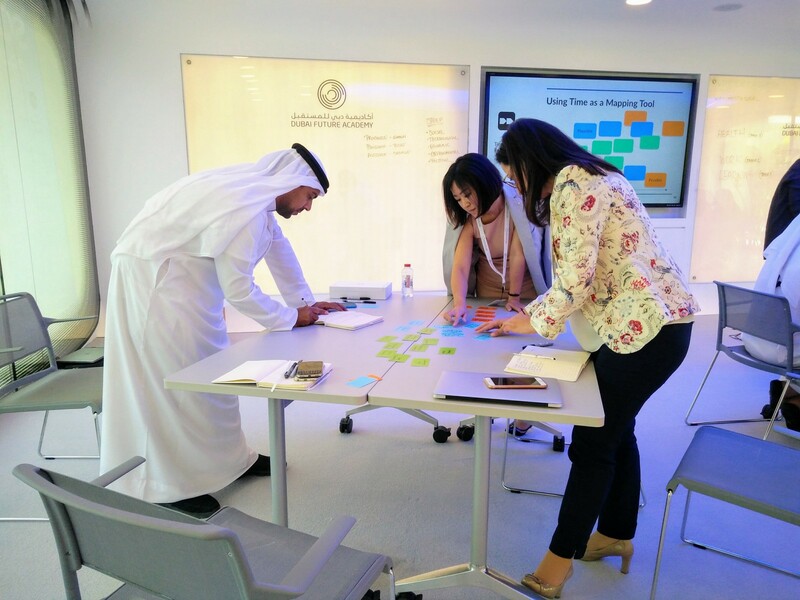 A cross-disciplinary team debates the meaning of the map in the Future Design Intensive at the Dubai Future Academy. The logic of this adage, known as Miles’s Law after an American civil servant of the 1940s, probably goes back to ancient times. It essentially means one’s view of a particular policy or issue is strongly shaped by the organizational or mission context of that individual. As bureaucratic creatures, we tend to prioritize concerns that directly impact our tasks or goals, and see them through our own individual, cultural or operational lens. What we often lack is the ability to explore and understand the issue from another’s point of view. This shortcoming is just as true in assessing the future: the aspects and drivers of the future that seem important are often determined by one’s professional scope or mission. But the future can take on a very different hue when seen from another department or role. Having different organizational lenses, natural time horizons, stakeholders or constituents can mean having very different understandings of issues that commonly impact across government, society, the economy, etc. It can also mean putting one or a handful of key trends or burning uncertainties front and centre, while relegating others to the “not critical” category. The linear focus of modern decision-making doesn’t allow space to understand other dimensions or impacts as seen from a different point of view. Take climate change as an example. From different business areas or organizations, this major driving force may have completely different perceived impacts, or be seen as a greater risk by one, and a catalyst by the other. Worse, it may have potentially devastating, or revolutionary, impacts that don’t appear obvious at first glance. “We’re not building waterfront property, so why should we care?” might go the question. Without accessible tools to unpick and explore big topics, we’re left to map the future from a singular point of view, never knowing if there might be hidden but common interests at stake, or a new possibility illuminated by seeing others perspectives mapped. 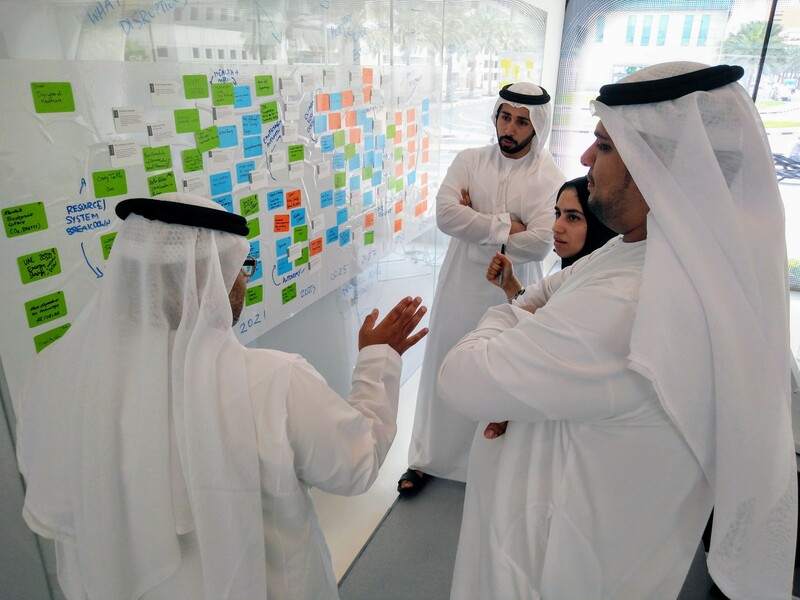 Teams generate driving forces impacting Dubai in coming decades. 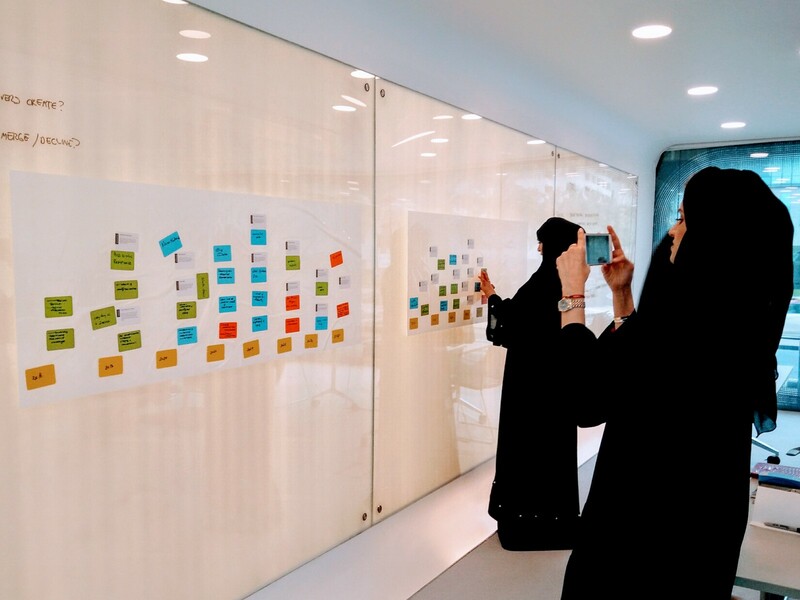 In fact, two teams in a recent Future Design Intensive at the Dubai Future Academy, one focused on Health futures, and one on Energy futures, had just this experience. From a health point of view, climate change is likely to have a range of potentially negative impacts: increased epidemics due to ecosystem disruption, increased deaths from temperature extremes and destructive weather, threats from dislocation of populations and resources, a rise in stress due to these disruptions, and more. From an energy point of view, climate change is a driver for a more rapid transition to sustainable energy production, a spur to innovation, but also a resource and infrastructure disrupter via flooding, sandstorms and other environmental swings. The implications for both teams have overlaps and connections, but also significant differences. 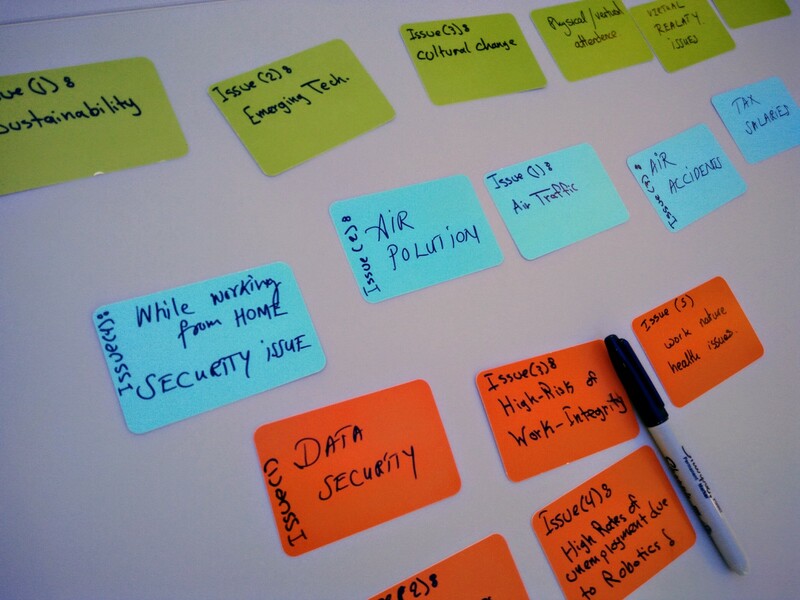 Two groups map the roles of common drivers in different sectors’ future timelines. Future Design creates an opportunity for professionals from very different sectors (in this case, human resources, medicine, architecture, and engineering) to look at major drivers of a common future from different chosen organizational and mission points of view through collective inquiry and structured tools for exploration at the sensemaking stage. By applying the tools of strategic foresight, our two teams were able to unpack and weigh up the implications, and draw out unanticipated impacts and opportunities from different levels, in ways that wouldn’t be as likely to happen focused only within sectoral silos. Even as the teams delved into different scenarios, they were functioning in the same broad world as the result of this collective exploration. The outcomes of the projects were different — one used energy transition driven by climate change to accelerate a new personal energy trading scheme, the other proposed ways to offset the mental stresses it may create. The opportunity to explore this mega-issue from different departmental perspectives, and even find common opportunities for innovation, can prove to be challenging when trying to determine a yield value, without a systems approach to exploration that Future Design provides. Similarly, both teams discussed the end of traditional work as a future driver in their scenarios — as a mental and physical stressor in health scenarios, and as a disrupter of stable income in the energy scenarios. For the former, it was an opportunity to anticipate the need for new support services, for the latter, it represented a need to identify new income sources for former workers. The two were connected by the need to anticipate and design support around future disruptions to employment before these risks fully emerge, rather than try to adjust after the fact. The emergence of the Internet of Things, the implications of Big Data, the push for sustainable architecture — the list of unseen common factors grew longer as the mapping iterated and evolved through reflection, research and shared discussion. Exploring future drivers in an open forum also provides a place to air important questions: What don’t we know? Which risks are hard to pin down? What drives our uncertainty? These questions—as well as the connections above—often remain obscured without fresh perspectives and tools to draw them out. As with some of the most valuable futures inquiry, the process our teams experienced didn’t resolve in solutions, but identified key questions all parties shared. These critical uncertainties became the jumping-off point for teams to explore through their scenarios—and ultimately, design concepts to address them. Thinking about issues and certainty/uncertainty. And this is the point. Without collective mapping of a possible future, and the tools and space to tackle hard questions about this future, these teams might otherwise carry on designing strategies unaware of others’ insights into these risks and opportunities. This is something that happens every day in complex organizations, whether they are private or public. We tend to pursue linear pathways, when we are not able to take the time or have a means of understanding where these pathways, or our framing of them, intersect — or clash — with the organization, team or mission next door. Find common opportunities for innovative policy, product or services that might have otherwise remained unseen. The next post in this series will look at another facet of Future Design — the power of this approach to put emerging technologies in context of social, economic or political change. For more information on Dubai Future Academy’s Future Design programme, check here. For a look at our launch experience, see this essay.